Since the turn of the twentieth century, scholars have questioned Paul's authorship of 2 Thessalonians, many believing it to have been written in Paul's name after his death in order to quell apocalyptic disruptions within the church. If the letter is authentic, then it is one of the first writings of the New Testament, coming shortly after 1 Thessalonians, which is usually thought to be either the first or second of Paul's existing letters. If it is not truly Pauline, then it may have been written any time from the later 50s C.E. to the early second century. 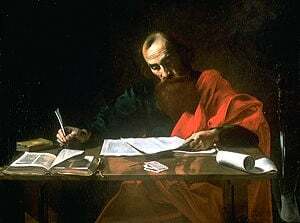 "I, Paul, write this greeting in my own hand," Paul writes in 2 Thessalonians; but today his authoriship of the espistle is increasingly questioned. 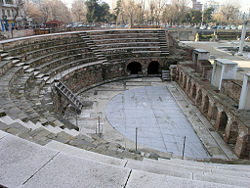 The traditional view is that the 2 Thessalonians was probably written from Corinth not many months after 1 Thessalonians. Apparently the first letter was misunderstood, especially regarding the Second Coming of Christ. The Thessalonians had embraced the idea that Paul had taught that "the day of Christ was at hand." The apostle corrects this misinterpretation and announces what first must take place before the end times. The opposing view of authorship holds that the letter was written after Paul's death in order to combat the growing apocalypticism and extremism, as evidenced by such writings as the Book of Revelation, as well as the Apocalypse of Peter, the Apocalypse of Paul, and other New Testament Apocrypha. Such visions of the impending Last Days led to urgent prophecies of coming disasters and consequent disruptions in church order, including the abandonment of professions by members of the church. Indeed 1 Thessalonians itself emphasized that the Second Coming would occur suddenly, without warning: "you know very well that the day of the Lord will come like a thief in the night." (1 Thess. 5:2) Cooler heads needed to prevail, and thus pseudepigraphal literature—written in an apostles name by another writer—such as 2 Thessalonians, Ephesians, 1 and 2 Timothy, and other pious forgeries were created. 2 Thessalonians itself indicates that such forgeries existed, referring (2:2) to a "letter supposed to have come from us." Pseudepigraphal writings were common in the ancient world. They were often not penned in the spirit of dishonesty, but in the sincere belief that the spirit of the "author" guided the hand of the scribe. Since the turn of the twentieth century, major studies by scholars such as William Wrede in 1903 and Alfred Loisy in 1933 challenged the traditional view of the authorship of 2 Thessalonians. There is still widespread dispute over the matter. According to Leon Moris in 1986, the majority of current scholars at that time still held to Paul's authorship. However the majority opinion today appears to be that the letter was not written by Paul but by an associate or disciple after his death, representing what they believed was his message. One skeptical writer, Norman Perrin, observes: "The best understanding of 2 Thessalonians is to see it as a deliberate imitation of 1 Thessalonians, updating the apostle's thought." Those who believe Paul was the author of Second Thessalonians often note how he apparently wrote the final salutation at the end in his own hand rather than through a scribe. Of this Bruce Metzger writes, "Paul calls attention to his signature, which was added by his own hand as a token of genuineness to every letter of his (3:17)." Moreover, the emphasis on eschatological themes (meaning a concern for such issues as the Last Days and the Second Coming) is often mentioned as evidence of an early date for the letter, in opposition to the proposition that it was written after Paul's death. The epistle was considered canonical by the second century teacher Marcion and is listed in the Muratorian fragment, the earliest orthodox list of canonical scriptures. It was mentioned by the bishop Irenaeus of Lyon, and quoted by Bishop Ignatius of Antioch, as well as Justin Martyr, and Polycarp of Smyrna. 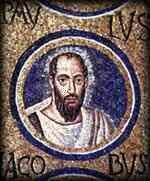 Indeed, no source in the early church doubted its authenticity. Regardless of its authorship, 2 Thessalonians was and remains an influential writing, especially considering its short length. It provided the impetus for two important Christian doctrines, the Antichrist and the Christian work ethic. The prediction of the "lawless one" later combined with similar prophecies in the Book of Revelation and references to heretical teachers called "antichrists" in 1 and 2 John to produce a horrifying vision of a satanic leader who would arise before the Second Coming of Jesus and lead the masses of people astray. Those who succumbed to his seductive teaching and satanically-inspired miracles would be doomed to Hell at the Final Judgment. Throughout Christian history, these predictions have inspired countless works of art and literature, including many popular works of fiction today, such as Tim LaHaye's best-selling "Left Behind" series. In its concerns that Christians not be swept up in extreme apocalyptic attitudes, 2 Thessalonians also insisted that "he who does not work, shall not eat." The intent of the writers was to influence a responsible work ethic among Christians who believed in the Second Coming. In 1 Thessalonians, Paul had expressed that many of his readers would still be alive at the time of the Christ's advent, when both the living and the dead would be "caught up into the clouds to meet the Lord in the air." (1 Thess. 4:17) Under such circumstances, some reasoned, working at a profession was pointless and even spiritually misguided. If the Day of the Lord were truly at hand, one must make urgent preparations to meet him, purify oneself, and strive with all one's effort to bring others into the fold. 2 Thessalonians strove to counteract this attitude by stressing the need for a more financially responsible lifestyle, since the exact time of the Second Coming is not actually known. From this saying, came the Christian principle that, while charity is a blessing to the giver, no true Christian should depend on the largess of others if he or she has the means to work. ↑ William Wrede, Die Echtheit des zweiten Thessalonicherbriefes untersucht (The Authenticity of the Second Letter to the Thessalonians investigated), (Leipzig 1903). ↑ Alfred Loisy, The Birth of the Christian Religion (University Books, New York, 1962), 20-21, (Originally published as La Naissance du Christianisme, 1933). ↑ Leon Moris, Concordia NIV Study Bible, Robert G. Hoerber, editor, (St. Louis: Concordia Publishing House), 1840. ↑ Bart D. Ehrman, The New Testament: A Historical Introduction to the Early Christian Writings (New York: Oxford, 2004), 385. Beverly Roberts Gaventa, First and Second Thessalonians (Westminster John Knox Press, 1998), 93. Joseph Francis Kelly, An Introduction to the New Testament for Catholics (Liturgical Press 2006), 32. ↑ Normann Perrin, The New Testament: An Introduction: Proclamation and Parenesis, Myth and History (Harcourt College Publishers, 1974). ↑ Paul E. Kretzmann, 2 Thessalonians, Chapter 3. The Kretzmann Project, www.kretzmannproject.org. Retrieved February 18, 2007. ↑ Bruce M. Metzger, The New Testament: Its Background, Growth, & Content, 3rd ed. (Nashville: Abingdon, 2003), 255. ↑ Donald Guthrie, New Testament Introduction (Hazell Books 1990), 593. Ehrman, Bart D. The New Testament: A Historical Introduction to the Early Christian Writings. Oxford University Press, 1999. Moris, Leon, and Robert G. Hoerber (ed.). Concordia NIV Study Bible. St. Louis: Concordia Publishing House. Online Bible at GospelHall.org www.gospelhall.org. History of "Thessalonians, Second Epistle to the"
This page was last modified on 25 November 2015, at 16:22.